Today we’re meeting for a workshop cheese making & stroopwafel baking. We’ll be visiting two cities, famous for cheese, syrup waffles and other regional, artisanal products. Outside it’s bitterly cold. Fortunately we can warm ourselves. It’s the people we meet and the food we eat that makes us feel warm inside. Let me take you by the hand and show you, step by step & by using all senses, how cheese is made and syrup waffles are baked. The workshop cheese making & stroopwafel baking is given by a cheese king and a stroopwafel specialist. The cheese king Jos van Riet has been in the cheese business for over 50 years. He is a true connoisseur of Dutch cheeses as well as Italian and French cheeses. Sit down, follow him around and listen to his entertaining stories. Have you ever smelled rennet? Jos explains that to make a beautiful round Gouda cheese we need milk. When the milk has the right temperature we add rennet and culture. We wait a bit more until the magic happens: the milk thickens and becomes a curd. We stir, cut, stir and cut until the curd consists of tiny, dry parts. The round moulds for the cheeses come in various sizes. We’re making a 12 kilo cheese today. In the video you see you need quite strong arms to put the Dutch cheese to be in the mould. 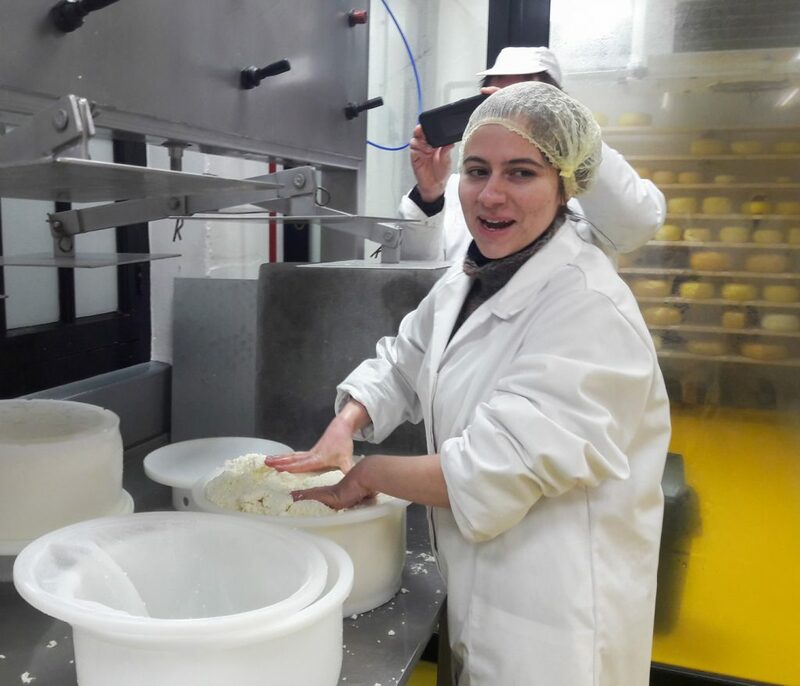 And did you know cheese making is often done by women? Next time you meet a female cheese farmer, have a look at her biceps! The cheeses to be are in their round moulds. They will be pressed, get a salt bath and wax coating. Then they sit on a wooden shelve and will regularly be turned and coated. For a month, a year, 3 years. Who knows, maybe even 20 years. We can’t wait for that so we head to the Gouda stroopwafel baker Mike van den Berg. The stroopwafel or siroopwafel, known in English as syrup wafel, caramel cookie (waffle) or treacle waffle is century old. In the 18th/19th century Gouda bakers started making syrup waffles. These are the basic ingredients to make a typical Dutch caramel cookie: flour, sugar, milk and eggs. Cinnamon as well as a mixture of different sugars for the syrup creates the unique taste. All ingredients have to be used in the right proportion. Every stroopwafel baker uses a different recipe and each baker has their little secret ingredient. Mike leads us past the stroopwafel machines, which make over 2500 syrup waffles per hour. In the treacle waffle workshop space the waffle irons are warm, the caramel is ready and the neatly shaped doughballs are waiting for us. While two of us place the doughball in the iron, others keep asking questions. Mike tells us about his other stroopwafel products, the plans he has to make different stroopwafel flavors. When we all have our own caramel cookie, it’s suddenly very quiet. We’re all enjoying the warm waffle filled with gooey syrup. Yum! This was a request from an American- Italian family for a Gouda Food Tour. They indicated they were hands-on, loved food and had no other plans that day. They practically gave me carte blanche to organise a full day program around food. I wanted to give them a taste of the best & most exclusive and chose to visit to Dutch cities for two typical Dutch food workshops with thé professionals in the art of cheese making & stroopwafel baking. A great experience for me as well as one of the participants was (nearly) blind – or visually challenged as I like to call it- and I got to see everything in a different way. Thank you, Biggs family!